Our Plaques may be fitted into a recessed area on the front of the markers and monuments or they may be framed or mounted anywhere else, such as, for display in a den, library, outdoor garden setting, or anywhere your love one enjoyed spending time. You may mail, email, or bring into the office any material that you wish to use and we will develop the artwork and submit it for your approval. The price for custom designed artwork, by us, will be quoted separate from any online order. If you have finished artwork available, prepared by you or by someone of your choosing, you may upload it at the time you place your order. 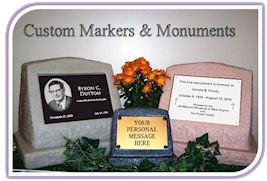 You may use our Graphic Design Tool to custom design the artwork as part of the Plaque ordering process. For some guidelines for using the Graphic Design Tool, see our Using the Graphics Design Tool Page. Black Marble: Laser engraved black marble, our best. For details and ordering guidelines, please visit the Black Marble Page. Dye Sublimation: Allows colored images. For details and ordering guidelines, please visit the Dye Sublimation Page. Ultra-Mat Bronze: Laminated, impact acrylic. For details and ordering guidelines, please visit the Ultra-Mat Bronze Page. Letterboard: Available on the Commemorative Monument, only. For details and ordering guidelines, please visit the Letterboard Page. Whiteboard Plaque: Intended to be a temporary plaque until your final plaque is available. For details and ordering guidelines, please visit the Whiteboard Page.